Prepare for Placement Test at Center for Academic Progress (CAP) (LH-A227), (203) 332-8585. Contact Health Services for MMRV (Measles/ Mumps/ Rubella/ Varicella) immunization requirement (L-111). Sign up for a LAUNCH: New Student Group Advising Session. Check Status of Financial Aid (L-111-A), (203) 332-5047. Register at the Registrar’s Office (L-113) and proceed to Bursar’s Office (L-123) if no Financial Aid. Submit an Admission (blue) Application & Request SAT Waiver, if eligible, at the Admissions Office (L-111), (203) 332-5100. You can APPLY ONLINE when available or download the application below. Register for LAUNCH: New Student Advising Session. Register at Registrar’s Office (L-113) and proceed to Bursar’s Office (L-123) if no Financial Aid. 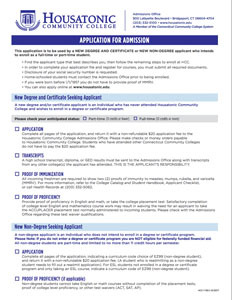 *Students who have applied to HCC in the past, but have never attended, should use the Reactivation Application, download here. If you sign into mycommnet and click on DegreeWorks you will be able to identify who your faculty advisor is. The good news is that if your advisor is unavailable, you can visit ANY of the faculty members within the department. Register!!!! Visit the Registrars office to register in person or Sign into mycommnet and get registered online - which ever works best for you!!! Online Registration is a registration option which involves accessing the college’s website and the link to myCommNet. In addition to an original registration, you may also add courses. Please note that this registration option is open to you only if you are paying for your courses with a credit card (VISA, Discover or Mastercard) or a financial aid award. All requirements mentioned in previous sections apply to online registration. Please note that you CANNOT drop courses online. Mail your completed Registration Form and payment method to HCC in an envelope. Kindly indicate that you are registering for credit courses. Drop-off, mail and fax registrations are normally processed within 24 hours of receipt. You will receive confirmation of your registration in the mail. You may also confirm registration at myCommNet. Download the form located on the bottom of the page. Fax your completed Registration Form and payment method to 203-332-5251. Drop off your completed Registration Form and method of payment in an envelope and place your envelope in the Drop-Off Box outside the Security Office in Lafayette Hall. Kindly indicate on the outside of the envelope that you are registering for credit courses. Pick up a Re-Admit Form at the Admissions Office (L-111) or fill it out online. Check Status off Financial Aid (L-111-A), (203) 332-5047. Register in Person at the Registrar’s Office (L-113) and proceed to Bursar’s Office (L-123) if no Financial Aid. Go to the Admissions Office (L-111). If Math or English was never taken at a College/ University then Placement Testing is required. Or meet an Advisor with your transcript in L-112. Register at the Registrar’s Office (L-113). Proceed to Bursar’s Office to make payment (L-123) if no Financial Aid. The Admissions Office assists anyone needing further program information. A personal interview is optional, and those who wish may make an interview appointment by contacting the Admissions Office at 203-332-5100 or by Email to .